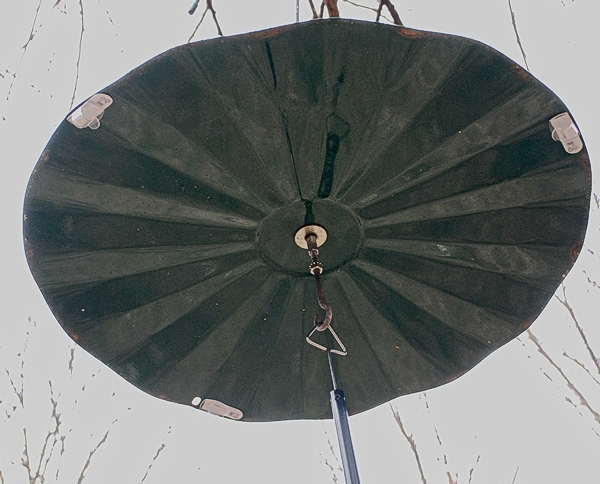 I use 21” wide Erva disk baffles over many of my bird feeders. Rather than replace them with wire halos or hang halos between the baffle and the feeder, I decided to try skipping the halo itself and just attach the hanging wires directly to the underside of the baffle. For my first trial of this system, I simply used an extra strong outdoor grade of electrical tape to attach the wire to the underside of the baffle, metal craft wire I had in my crafting stash, and random nuts and washers we had around the house as weights. I knew the tape wouldn’t last forever but figured it would last long enough to test things out. 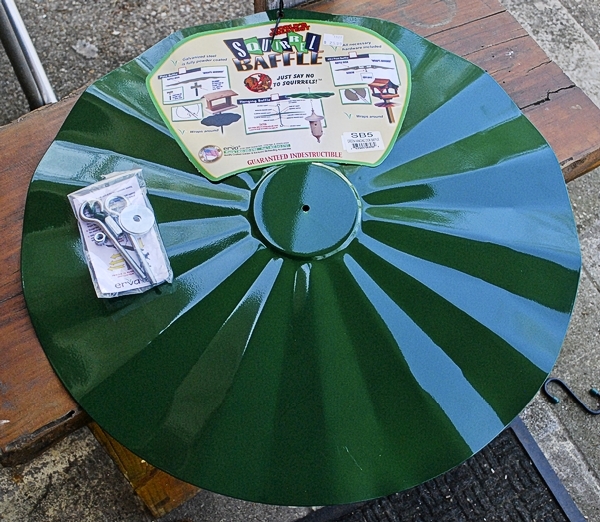 My test with the wired baffles went well for deterring House Sparrows. As soon as the wires went up on the baffle, the House Sparrows no longer got on that feeder. They instead started poking around under some other nearby cage feeders to pick up bits of sunflower hearts that the American Goldfinches were dropping. It didn’t magically get rid of all the sparrows in the yard, but it did work to keep them off this one feeder which they had taken a particular liking to. So between this and removing nearby brush piles (which made a dramatic difference in House Sparrow numbers), it was a good start. Before I explain how I put this together, I need to point out that there are some potential downsides to these wires. While most things you read make it sound like only House Sparrows will get spooked by the wires, in reality most of the birds in my yard seemed a bit flustered by them the first time they encountered them. Some reacted by fluttering around the wires a bit and then going to a different feeder. I won’t know how much of this aversion is temporary and how much is permanent until more time has passed. Some birds were more persistent or maybe just maneuver in the air a little better and they figured out how to manage around the wire within a day or two. Other birds watched and learned from them. The White-Breasted and Red-Breasted Nuthatches tend to vary. Sometimes they freak out and other times not. It may depend on the individual. The White-Breasted Nuthatches usually have a particular approach to this feeder from the tree’s trunk. When I switched to the permanent wires, I tried to arrange it so that there wasn’t a wire hanging directly in this flight line. This seemed to do the trick for them. 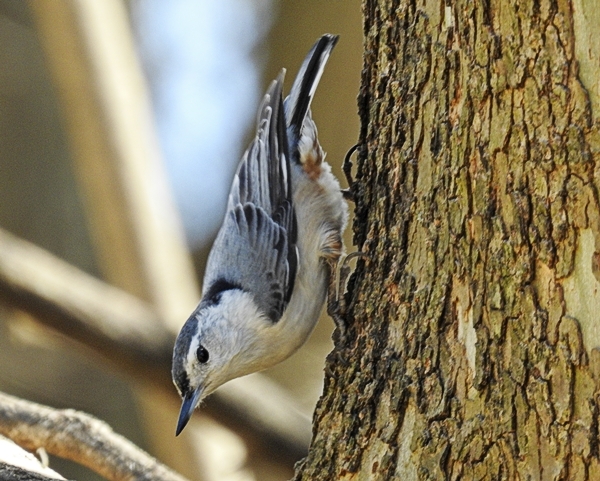 It has actually been really interesting watching the nuthatches figure this out. There was one little White-Breasted Nuthatch who was initially freaked by the wires. I watched her repeatedly approach the feeder from the tree’s trunk, only to flutter back to the trunk at the last minute. I’ve watched her do this a few times and each time, she got it right by the third attempt and then went back and forth a few more times without trouble. I wanted to cheer for her! 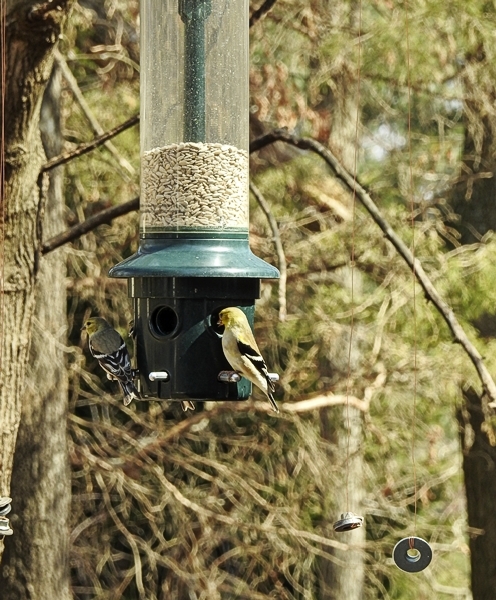 So far I haven’t seen any of the other backyard birds on this feeder, including any of the spring mixed flock birds that have been descending on the yard lately, even though I have sunflower hearts in the feeder. I don’t know if it is because they don’t like the wire or if it is because I kept messing with it and the changes made them nervous, but the permanent wires have been up for awhile now and they still haven’t come near it. 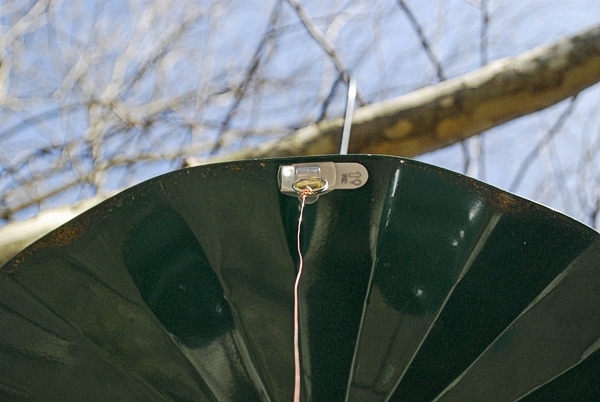 Another downside is that when it is really windy, wires attached to a wind-swept baffle can whip around. When I wanted to attach the wires more securely as a permanent solution, I needed to figure out an attachment that would let me remove the wires as needed. The halo suggestions I had found online said to use very thin 28 to 30 gauge metal craft wire and not monofilament which could entangle birds. 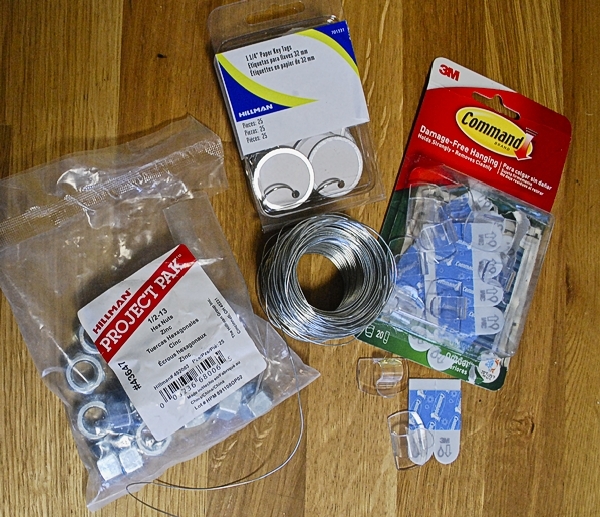 So I got a spool of 28 gauge wire from my local Michaels craft store. 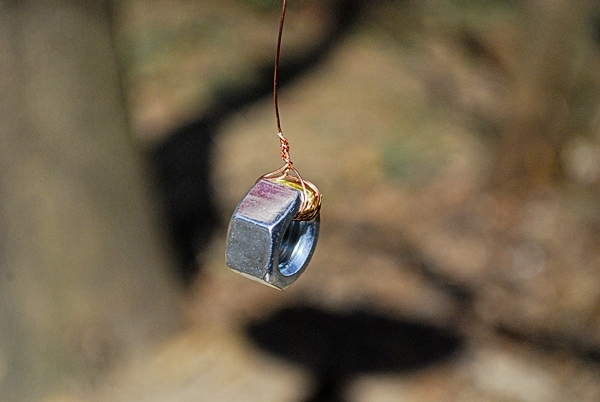 My experiments with this weight of wire did not go well, as the wire broke off in use several times where it attached to the heavy nuts, so I had to find the nut on the ground and re-hang it. I think this wire weight is just a little too thin, so I went back to the somewhat sturdier wire that I had used in my trial. It was in my craft stash and unmarked but I am fairly sure it is 24 gauge wire. (Note: I saw a pack of what looked to be the same weight wire at the local home improvement store.) It is proving to be not as fragile as the 28 gauge craft wire. You want the wires to run from above the feeder down to a bit below the feeder so the feeder is completely inside the wire perimeter. You can run the wires all the way down to the ground and stake them if you like, which is supposed to keep the House Sparrows out from under the feeders as well, but for now, I’m just focused on keeping them out of the feeder. I followed the Command hook package directions to attach the hooks. First I cleaned the baffle underside where I wanted to attach the wires with rubbing alcohol and dried it with a paper towel. I peeled the protective paper off one side of one of the adhesive tabs that come with the hooks and pressed it onto the back of the clear plastic hook. Then I peeled the protective paper off the other side of the adhesive tab and pressed the whole thing onto the prepared surface of the baffle, holding it firmly in place for thirty seconds. Because I was using a 21” baffle instead of a 30” halo, I was worried that the change would make the wires too close together, so I decided to try using just three vertical wires instead of the four used in the original halo design. This allows a little more space for birds to get through the wires. I spaced the three wires evenly around the underside edge of the baffle. Then I wrapped and twisted that extra length of wire through the hole of the nut multiple times. I used a pair of pliers to crimp the ends of the wire so that there were no sharp ends exposed. To string the wires, I needed to go up and down the ladder three times but it probably only took fifteen or twenty minutes to do the whole thing. If I want to take the wires down, I will probably need to use a small step ladder, but I’ll be able to simply lift the rings off the hooks to remove the wires. There aren’t that many really windy days when I’ll need to do this, so I think it will be fine. I’ve been only using these wires for a short time now. I still consider it an experiment at this point as I want to see how the wires hold up, whether three wires vs four continues to work, and which birds get use to the wires and which birds don’t. I will update this post as I learn more, but in the meantime, I hope this is helpful to you if you are trying to get House Sparrows out of your feeders.